Released: March 2012. Genre: Racing. Oh Ridge Racer, what happened? It didn’t seem so long ago that Namco’s arcade racer was on top of the gaming world. Four increasingly superlative efforts lit up the original PlayStation, before a peculiar, abrupt shift in philosophy signalled the beginnings of the end. 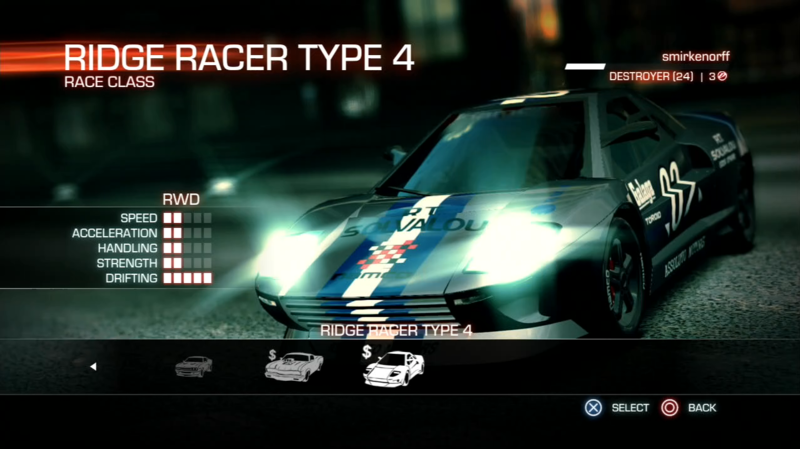 Starting with Ridge Racer V, a sequence of numbered instalments served as tech showpieces for the PlayStation 2, Xbox 360 and PlayStation 3 launches respectively. All three were reasonable, but not especially memorable. It wasn’t as though the series had its arcade racing crown snatched from it during this period; more that Namco seemed uninterested in even contesting it. The clumsily-monikered Unbounded was intended to mark a reinvention for the series. Instead, it would prove its nadir, the final nail in the Ridge Racer brand’s coffin. Rather than trailblazing new ideas, it made the same mistakes as the rebooted Medal of Honor: shamelessly aping the games that once looked to it for inspiration, and highlighting how far behind the curve it suddenly found itself. Namco have since seemingly retired the series, perhaps mistaking a lack of commercial enthusiasm for arcade racers having had their day. That’s debatable, with Need For Speed enjoying a prolonged period of success, and there’s still lots of love for older racers in the retro community. Players can still find room in their hearts and their collections for arcade racers, they just don’t want bad ones like Unbounded. Take Need For Speed’s gritty concrete jungle, mix it in with Split/Second’s track-mangling shortcut possibilities, add Burnout’s nitrous-fuelled, risk ‘n’ reward points system and what you’re left with, inevitably, is an instant-classic of the racing genre, right? Oddly, no. A while back, Shane and I mused over the comparative lack of genuinely bad seventh gen racers, working under the assumption that the use of modern development engines somewhat ensures an acceptable standard. Unbounded isn’t BigRigs-bad, of course, but it’s poor in a less obvious sense. It fails, inexplicably, to reach a basic level of quality that you’d have been forgiven for thinking all-but-guaranteed given the technology, budget and personnel involved. Unbounded’s autopsy is a painful one, but the root of all its troubles, perhaps not surprisingly, lies squarely with its gameplay. We all loved the early Ridge Racers because they got the basics right. That’s a major understatement: they got the basics fantastically right. Great handling, great track design, great gameplay: all of which was made possible thanks to a strong foundation. With Unbounded, bread and butter elements such as car control and the slide mechanic are a major hindrance. Vehicles are slow to react and cumbersome when they do, whilst powerslides feel overly-sensitive and lack the intuitive feel of the series in its pomp. As a result, it becomes as much a battle with your own vehicle as a race against competitors, and is devoid of enjoyment. The races themselves blight the player with a limitless stream of unfortunate incidents, to the extent where it would be appear almost comical, if it wasn’t so exasperating. The A.I. is extremely competitive, which is no bad thing in itself, but when it takes only one small blip to scupper your chances of victory, it becomes impossible not to see them as a focal point. You’ll win the odd quiet race without any hiccups, but the vast majority of the time, Unbounded seems determined to trip the player up in odd, incidental ways. Committing to “boost fragging” an opponent is an unnecessarily risky business as A.I. appear randomly resistant it. Other times, you’ll quite literally be dragged into someone else’s accident, snag your car on a competitor so as to miss that all-important shortcut or, following a successful takedown, end up bundling straight into your victims wreckage. If it’s not any of the above, its being aggressively barrel-rolled after a seemingly routine clearance of a shortcut, being pitched into spins or slides on bumps or hitting the one solid, crash-inducing pillars amidst a sea of destructible ones. There’s so many little ways in which things go wrong, and even after prolonged play, it almost always does. Unbounded was built around the idea of building and racing around your own circuits. Online servers closed three years after the game’s launch, but judging by the piecemeal track editor, no one’s missing much. Comprised of just a few basic straights and corner variants, it’s a lamentably bare effort that makes mid-nineties editors in racers such as Jaguar XJ220 (SCD) and Micro Machines 2: Turbo Tournament (SMD) look extravagant by comparison. Worse still, it inadvertently draws attention to how made-to-order, and samey, the tracks feel. No more Batman films for Shatter Bay! What you can say about Unbounded’s cityscapes is boy, there’s a lot of scenery. Perhaps too much, given the dark, moody surrounds; the corner markers prove invaluable for navigation and even then, circuits are difficult to navigate due to the sheer amount of scatter that draws the eye. A very great number of buildings, pillars, parked cars, walls and, well... concrete, really. It’s another example of how the series’ creative evolution appeared to have ceased. The early RR’s will forever be associated with sun-drenched beaches and brilliant blue skies, before Rage Racer added gritty waterfronts and R4 topped the lot with its world-beating presentation and the glorious, exaggerated speed-streak effect of its cars’ tail-lights. Unbounded will be remembered for an urban setting comprising entirely of bits you’ll have seen before, and precious little identity of its own. 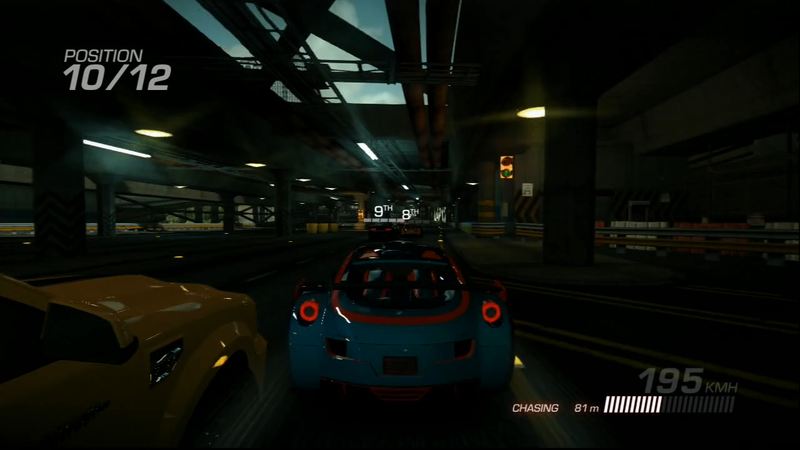 Even the cars, so long the pride and joy of Ridge Racer, are a big disappointment. They look lacklustre by the series usual standards and seeing Unbounded dredge up a couple of classic models from the nineties and reimagine them with duff handling is really sad. Whilst the career mode is mostly tedious and deflating, there are a couple of brighter moments. Fragging police cars in a truck, for instance. A couple of the time trial events are quite diverting, particularly ones that involve outrunning the law. Drift events are an absolute misery however, whilst the races are too inconsistent to provide more than a fleeting sense of enjoyment. Taken on its own merits, Shatter Bay’s career progression, in which quotas of points are required to unlock new events, is a sound one. It encourages replayability through improving your performances, but coupled with such punishing, unrewarding gameplay, it’s likely many won’t stick with it beyond the opening few events. 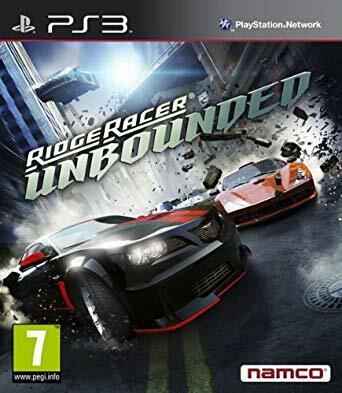 Unbounded serves as a cautionary reminder as to how far racers have come, and how far Ridge Racer has fallen, since the turn of the millennium. There’s a lot that I associate with the series in its pomp; lurid, satisfying powerslides; strong handling; epic, helter-skelter race tracks and gorgeous, distinctive visuals. Sadly, Unbounded has none of this. Even without taking into account its heritage, Unbounded is also a singularly poor modern racer. If you’re a fan of the series, it’s probably better to pretend it never happened.